Some days you just need to get outdoors and breathe. With the winter just around the corner I’m becoming more conscious of the fact there will be less opportunities to do this as shorter, wetter and windier days set in. In an attempt to soak up every last drop of sunshine I’ve been doing lots of outdoor children’s activities with my two girls, including a long overdue visit to Saltram House and Estate just outside Plymouth in Devon. It’s is one of Britain’s best preserved Georgian houses. Before the current stately home was built there stood a Tudor Manor on the site. Saltram has been a favoured residence for wealthy landowners down the centuries as the nearby estuary was a place where salt was harvested from the Middle Ages. This is where the name came from. There’s no doubt Saltram is steeped in history but what’s there to do for families? There was a clever apple-themed children’s trail in the garden when we visited in October. Each answer was revelled by placing a red foil over the clues on tree stumps dotted around the gardens. 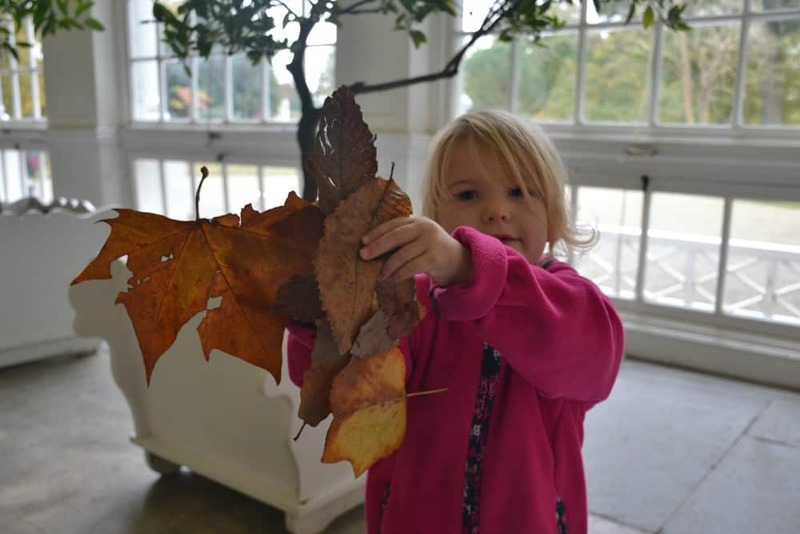 When we visited during half term National Trust staff were helping children make wild art using fallen leaves, twigs and seeds. However, this is something you could do at any time of year. Just bring a bag and pick up pieces of foliage you find on the floor to make a picture when you get home. Be sure to only select dead leaves! 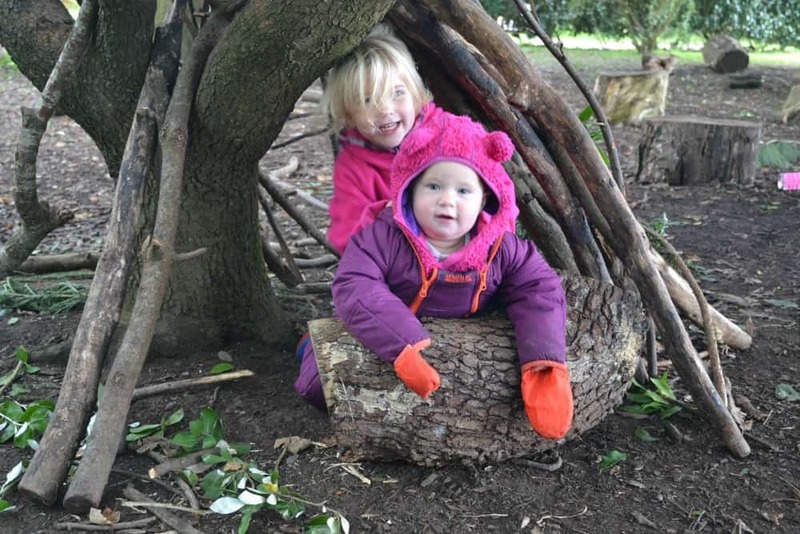 Saltram has a wooden adventure playground at its entrance which you can use even if you are only visiting the estate for walk in the grounds. Tin Box Tot and Baby loved going down the slide and jumping across the tree stumps. What kid doesn’t like climbing trees? The best one we found at Saltram was outside in the car park. You can’t miss it – it’s huge! At the far end of the gardens you’ll find a summer house that was built in the style of a castle. It has lovely views out towards the estuary. Inside Tin Box Tot found a china tea set laid out on a table in the centre of the room. As this was a castle she deduced it must belong to a princess. This is one of Tin Box Tot’s favourite outdoor activities at any National Trust property. She’s also a meticulous foreman – first taking apart whatever structure we find in the clearing and then putting it back together piece by piece. She can be a bit bossy too! A quizzical look crossed Tin Box Tot’s face when we walked past these half cat, half human statues that guard the house. They were an interesting talking point. As well as the garden trail, looking for fairy doors was a great motivator to encourage my girls to explore. As well as outdoor activities there’s plenty to do in the house. We stuck to the outdoor children’s activities at Saltram as it was just me and the girls (and they get super-grabby hands in any environment filled with expensive antiques and ‘do not touch’ signs). However, we will definitely be returning to see the house another time. What’s your favourite National Trust property? We’d love some recommendations!